On April 19, 7 PM, the Hill Police Department is hosting an informative meeting about the recent events on Currier Road. The meeting will be held at the Public Library. As you may already know, The Hill Police in cooperation with the Drug Enforcement Administration, The NH State Police and the NH Drug Task Force arrested two people for manufacturing methamphetamine. “Meth” is an extremely addictive and dangerous drug. The manufacturing process is extremely dangerous. The waste and by-products of it manufacturing is extremely toxic and equally dangerous. The Hill Police Department encourages residents (especially those who live in the Currier Road, Tioga Road and Bunker Hill Road areas) to attend this brief meeting and to learn about the “Meth Lab” that was in Hill and to become aware of some of the materials that may still exist in your neighborhoods from this lab. With public awareness of the dangers of Methamphetamines, and with your assistance, the Hill Police Department hopes we can prevent future occurrences of drug labs in the Town of Hill. For Information about the meeting, call the Hill Police Department at 934-3949. PROTECT YOUR FAMILY, PROTECT YOUR NEIGHBORHOOD, PROTECT OUR TOWN! Libraries are places for new beginnings. Whether getting your first library card, learning new computer skills, or planning a trip, the library is the place where your story begins. However, libraries are much more than a place to find information; they are a place to exchange information, ideas, culture, stories, and a wonderful place to socialize in general. Everyday across the country, libraries are helping people enrich their lives, helping people to create their own unique stories. Why not visit HPL and find a new beginning? Check out the latest by Jodi Picoult! Open an email account! Design an herb garden! Read your hometown newspaper! Join our amazing Book Club! Learn how to knit! Find a great pasta recipe! Where will you start? Create Your Own Story @ your library. In celebration of National Library Week, the Friends of Hill Public Library will be holding its annual Hill Baby Book Dedication, honoring the children born in 2010, on Friday April 15, 10:00 AM, at the Jennie D. Blake School. 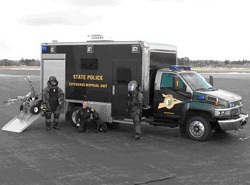 A presentation by the NH State Police Bomb Squad will follow the book ceremony. All are welcome to join us for this explosive event!